Seasoned minced beef with carrot, onion and red pepper. British Beef (61%), Vegetable Blend (30%)[Carrot, White Onion, Red Pepper], Diced Apricots, Rice Flour, Dried Potato, Salt, Spices, Sugar, Garlic Powder, Dried Onion, Dextrose, Lemon Peel Powder, Preservatives (Sodium Metabisulphite, Sulphur Dioxide), Herbs, Rapeseed Oil, Dried Honey, Emulsifier (Mono- and Di-Glycerides of Fatty Acids), Flavouring. Irish Beef (61%), Vegetable Blend (30%)[Carrot, White Onion, Red Pepper], Diced Apricots, Rice Flour, Dried Potato, Salt, Spices, Sugar, Garlic Powder, Dried Onion, Dextrose, Lemon Peel Powder, Preservatives (Sodium Metabisulphite, Sulphur Dioxide), Herbs, Rapeseed Oil, Dried Honey, Emulsifier (Mono- and Di-Glycerides of Fatty Acids), Flavouring. 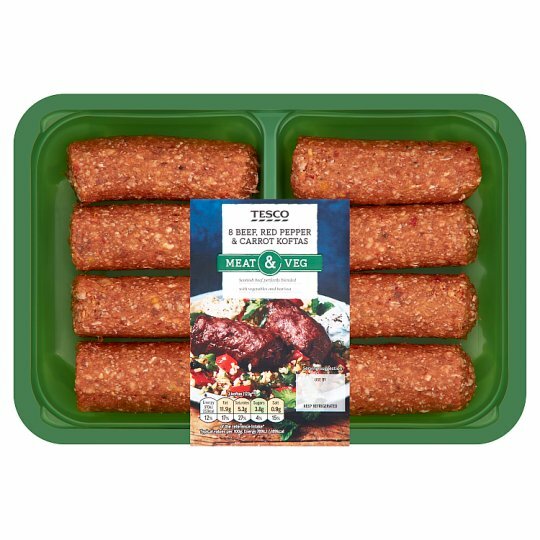 Scottish Beef (61%), Vegetable Blend (30%)[Carrot, White Onion, Red Pepper], Diced Apricots, Rice Flour, Dried Potato, Salt, Spices, Sugar, Garlic Powder, Dried Onion, Dextrose, Lemon Peel Powder, Preservatives (Sodium Metabisulphite, Sulphur Dioxide), Herbs, Rapeseed Oil, Dried Honey, Emulsifier (Mono- and Di-Glycerides of Fatty Acids), Flavouring. Instructions: Place under a pre-heated medium/ high grill for 16-18 minutes turning occasionally.